The rise of websites that produce online petitions would seem to be a boon for democracy. It reduces the time and effort of participation. Petitions are another avenue for people to have their voices directly heard by government. In recent years, I've signed petitions to stop human rights abuses abroad, to increase health care coverage, and to stop planes from Newark from flying over my house. I didn't have to deal with somebody waving a clip board in front of me at the supermarket or even talk to anybody. Win-win, right? However, recent research questions the impact of mass produced petitions and finds that these petitions may even slow down the gears of government. 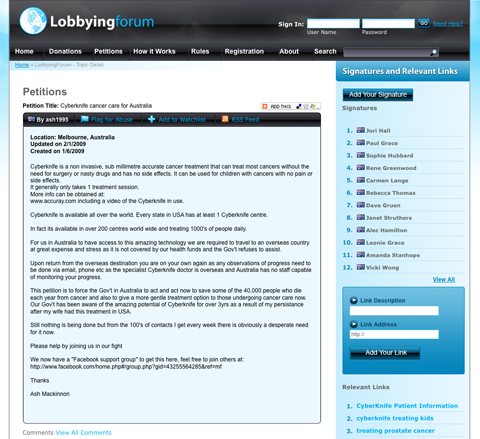 At LGM, Charli Carpenter explains how to make online petitions more effective. Sure, use the above websites to formulate your opinion. Use their online form to submit it. But delete the form letter and put it in your own words. < Previous Are Toyota’s Woes Good For America? But delete the form letter and put it in your own words. If that is too much effort, go to Google translate. Translate the form letter to Serbian, then to German, and then back to English. I urge you to support House Bill 1456 and honor our nation’s nine-toed dairy workers. Позивам вас да подржава Предлог закона 1456 Кућа части и девет наше нације врхом радника млекару. Ich lade Sie zu unterstützen House Bill 1456 und neun Ehre unserer Nation top Molkerei Arbeitnehmer. I invite you to support House Bill 1456 and nine honorary our nation’s top dairy workers. But, yes, computer translation is clearly better than I remember it.